We recently introduced a new engagement ring with a Christian design theme, and I thought this might be a good opportunity to highlight some of our Christian rings. The new engagement ring is HE279 (pictured on the left), featuring the ichthys or Jesus fish. This ring is pictured with a bezel-set round diamond, but it can also be horizontally set with a marquise diamond. This is a very eye-catching design with a wonderful simplicity to it. Another engagement ring with the ichthys motif is HE265 (pictured on the right), showing two fish on either side, with the tails supporting the center diamond. It’s definitely a much more subtle design compared to HE279 and more versatile, as the marquise-shaped accents also look like Grecian leaves. The ichthys was used as a secret symbol by early Christians and is a Greek acronym translating into “Jesus Christ, Son of God, Saviour.” The symbol experienced a revival in the early 1970s and is now a well-recognized symbol for Christianity. For a wedding ring, anniversary ring, promise ring, or other occasion — such as a Confirmation — an appropriately Christian choice is one from our rolling ring collection. Rolling rings feature three separate but interlocking rings that fit together snugly and wear comfortably. Also known as Trinity rings, they represent the Holy Trinity: the Father, the Son, and the Holy Spirit. We offer them in a variety of metals, widths, and with or without diamonds or gemstones. This is one of my favorite choices. 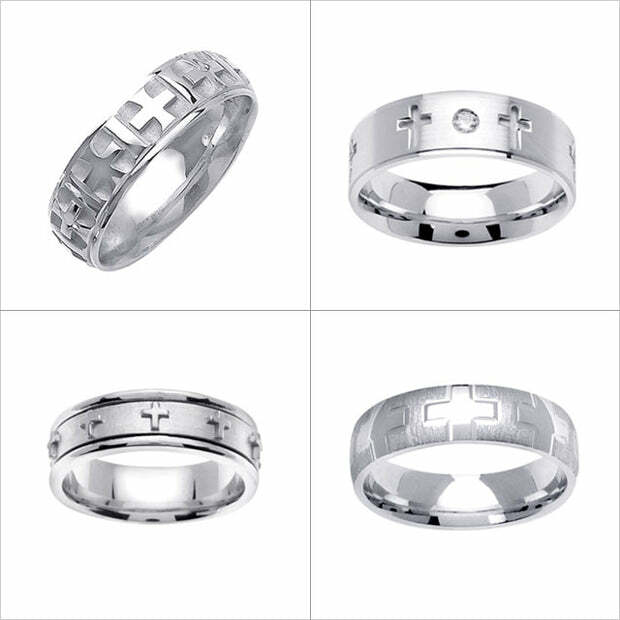 For men, we offer several men’s wedding bands featuring cross designs. The cross, of course, is the most recognizable of all Christian symbols. Here are four from our collection. Click on any ring for more information about that particular style. Of course, these designs are just the beginning, as we’re able to custom make any Christian themed ring you desire. For more information about our custom process, please click here. If you like this, you may also find my blog post on Popular Bible Verses for Engagement Ring Engravings of interest.